I know, I know, I'm a sucker for an awful pun. And no, I haven't taken up a new instrument, but Nick my melodeon tutor has - he has become a Weaver! 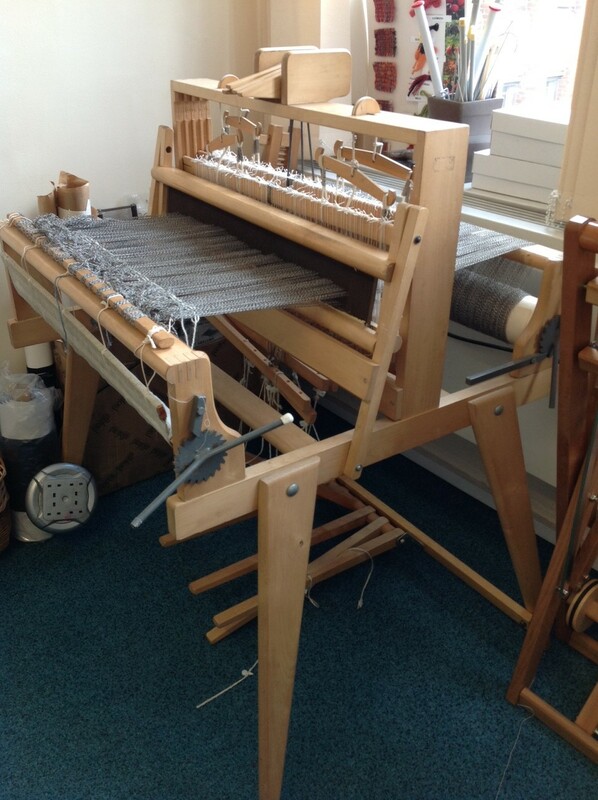 Already an accomplished spinner and knitter, Nick learned to weave, and is currently giving demonstrations on a reconditioned 19th Century loom at the Bridewell Museum in Norwich. I was fascinated to hear about the history of the Flemish weavers in the city, he does a good talk as well! This loom is now ensconced in their tiny terraced house in Norwich- he has VERY understanding house-mates! I think there is another demo this month, if you are in the area, check out the dates on-line. And for those more recent blog-followers, you can hear Nick and his band Triette playing fantastic music on their website. I don't know where he gets his energy from. OK, yes, being young helps, but even so. Applique nearly finished, lettering to complete and cushion make-up. Viewed from Jim's chair, the re-vamped cheap magazine rack. I used the same paint I did the dining room chair with, but wanted it more green so I ..er...squeezed some acrylic emerald children's paint into the tin of vinyl matt .....yes, I know. You shouldn't do things like that, but I got away with it. (I had visions of the whole tin ending up like cake mix which has separated) (phew).So the other chairs will be slightly greener than the first one. No I am not going to repaint the darned thing. Yes, I know you would, and I should, but again, this is too much like unpicking stitches: don't go there. Yes, it was time to bottle my Wild Garlic Oil, after 18 days of macerating in a dark cupboard. I have to say it is milder than I expected, just quite a gentle flavour, more chivey than garlicky I'd say. I'm quite chuffed. I couldn't bear to waste the squeezed leaved, so chopped them into the mashed potato which covered the fish pie we had for supper yesterday, and I think I will just freeze the rest and bung it into a risotto or something. I have been amazed at the number of references to Wild Garlic I have come across recently - in magazines, novels, newspapers, on the television .... perhaps it's time for the next Big Thing! Just a little stitched and appliqued sampler I did last year; several people including the owner of the shop have asked that I teach it as a workshop so that's what'll be happening. And that's what I've been up to; Bank Holiday is going to be very relaxed, and I'm hoping for more sunshine - we had a few rain showers today, what's that all about, hey?? Hope you have a good weekend. Oh yes i want to come and learn, I need a few days notice in case I need to change my work rota. I love learning new skills. Basic sewing skills only, and a few simple embroidery stitches. You probably won't finish the whole sampler in a day - unless you are EXTREMELY swift! but will complete enough so that you can work on it in your own time; I will provide a handout. Flowers look lovely and the workshop sounds like great fun. Thanks Gill, there's so many of them in the garden this year. I stopped teaching workshops years ago, but the opportunity came up out of the blue so I thought I'd give it a go. Watch this space!! Pretty sampler, the type of thing I would do for my granddaughter's bedroom, if it was the type of thing appreciated in that household. Handmade isn't appreciated, as I discovered long ago.... neither am I come to think of it, but their loss! Gorgeous and sunny and warm here, off to make pineapple upside down cake for pudding today, and sort out my next little knitting project. Hi Maggie, yes, you have to be really careful who you offer anything handmade, it's not worth the rejection, some people have no taste!!!! Pigeons are a nuisance but the rooks are a whole lot worse. The racket they make is horrendous. I'm totally fed up with them. That loom looks so cool. It amazes me when I see someone weaving on one of those. That and a potter's wheel . . . they both are intriguing to me. Very earthy and grounded. I've long been fascinated by weaving - and potting, too, as a matter of fact. Listening to Nick being all enthusiastic makes it all very interesting.Both examples of taking simple raw ingredients - water and clay, or wool, cotton, any fibre in fact - and creating something of use and beauty. Thanks for visiting - is it Connie or Connie's Other Half? Love your applique - reckon it will look really nifty when it's done. I must try that hand stitched applique sometime - I do all mine with freemotion machine stitching - it just looks so fab when done by hand - a totally different look. I hear you on the prolific blogging habits of others. Nice to read them but I do tend to fall behind in my reading, let alone trying to keep up actually posting something of my own! My days are just so full - and I never get everything done anyway - things spill over from one day to the next. Bank holiday weekend has been glorious so far - just lovely. Hope yours is too. Hi Wendz, thanks for your comment. I've done a lot of machine appliqué - and even more free-machine applique in my day, but I really enjoy slowing it down these days. And that's why I enjoy working in wool and felt - no hems! Now you know I love Trieste and the guy spins, knits and now weaves as well?! I'd ask 'is he married yet? ', but I'm old enough to be his Mum!